it was a fantastic Closing Bonspiel. Take a look at some of the participants above. More pictures are under the Photos tab. Congratulations to Louise Lance for winning our first Brighton Cup! Louise entered every event possible (she couldn’t find a way to participate in the Bill Dunk Senior Men’s) and came 1st once and placed second twice on the way to amassing 47 points. Despite a Closing Bonspiel push by Otto, Judd and other pursuers Louise couldn’t be caught. Complete standings are in Members Home. Thanks to all who competed in our various Bonspiels. log into Members Home for a recap of the Senior Mens league Fun Day. The 2019 Canadian Open Stick Curling Championship is being held in PEI, hosted by the Cornwall Curling Club from March 31-April 3 2019. Our very own Don and Nancy Sheppard are competing. You can follow on how they are progressing by pressing on this link. For pictures and clips for this event. Just press on the PEI Curling website here. Quote from veteran curler Louise Lance: "Today was one of my favourite days of Curling ever—and I didn’t even play! Our rookies are The Best!". Go to the Photos tab for more Rookies Bonspiel pictures. Photos and names of the winning teams are under the Home page Photos tab. We are one of the friendliest clubs in the area. If you are visiting Brighton, please drop in during curling hours; visitors are always welcome! If you plan to move to the area, or are already a resident and considering curling, check us out. Our club features competitive rates, good curling, as well as providing a great opportunity to meet your neighbours. You’ll find a suitable daytime or night-time league no matter what your skills – from beginner to expert! We have men’s, ladies and mixed leagues – and a junior section. In addition, we offer training and workshops for adults and juniors. Each year our Club sponsors major Bonspiels. More details can be found by clicking on the Club Events tab, which is located at the top of this Home page. Registration information is also available under the same tab. While we can’t guarantee Bonspiel success, we can guarantee competitive curling, fellowship, delicious food, and a good time. If you need any more info, try the various tabs on the top of this Home page. You can also provide us with comments or questions by using any of the "Contact Us" mechanisms. At the Casey Charles Super Seniors Bonspiel on February 16th, the BDCC team of lead, Doug Cheer, second Ian Graham, third Dave Harrison and skip Barry Kant took first place in the early draw event by ¼ point over the Harry Litvin team from the Peterborough Curling Club. Harry, who is perennially in the money in this bonspiel, beat us out for first last year. TEAM KANT DOES IT AGAIN- THIS TIME IN QUINTE. In the Saturday February 23rd Bill Riley Seniors Bonspiel, the team of Mike Hawrylow, Stephen Pardy , Dave Harrison and Barry Kant finished as runner-up in the late draw event to the winning Quinte David Livingston team after previously beating the Bob McPherson and Bob Fellows Quinte teams. David was one of the Bill Dunk Memorial Seniors bonspiel winners this year. Meat for the freezer as a 2nd place prize. Check out the Grand Slam of Curling - broadcast schedule, news, teams, results and standings. You can also view the hilarious Benny Heebz videos/interviews. Click here for various levels of curling instructional material. How to Access Latest Member and Club News, and Other Member Functions. Scroll down to the Member Login area of this home page. Enter your Username and Password, and click on the blue Login button. The Club and Member News pages come up. Member's Home is really quite useful. Try it. Come play in our House! Check out our leagues today. 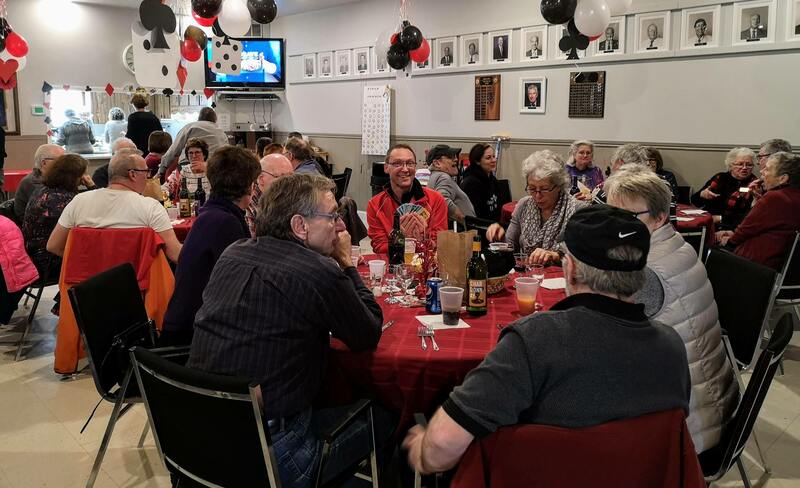 "I'm looking forward to another winter of curling and sociability at the Club"
"When deciding on our retirement destination, we looked for a community that had accessible summer and winter activities. We were delighted to discover the Brighton Curling Club, where we've made good friends and have lots of fun."